Do you want Fortnite (Free) mobile invite codes? Hit up our Discord server. Why? Because TouchArcade is no more. The former rulers have been deposed. Welcome to an exciting new era in the website’s history, as Carter and I officially cut the red tape for FortniteArcade, where we’ll be keeping you in touch with the latest in Fortnite mobile gaming. Okay, there hasn’t really been a coup – Eli and Jared are just at GDC, and we’re still writing about loads of other awesome mobile games that have been released recently, but Fortnite (and arguably to a lesser extent PUBG Mobile (Free)) are the talk of the town of late. However, rather than discussion on that sweet, sweet victory royale, many people are still stuck in limbo waiting for an invite code to dive into the Fortnite action. 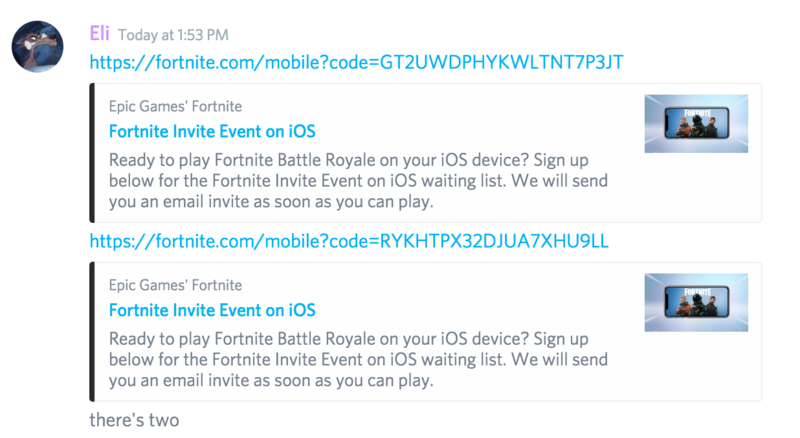 If you haven’t been able to jump off the magic starting bus as of yet, don’t worry – TouchArcade staff and keen community members are giving away numerous Fortnite invite codes for free on the Discord server. FREE CODES! What more do you want? To be honest, what I’d like is to be a bit better at the game – trying to juggle moving, shooting and building all at once on my decrepit iPhone is difficult, and I really can’t wait for MFi support down the line. However, I do have a PS4 that is picking up dust – you may throw your mobile gaming friends under the bus, but playing cross-play on consoles is always an option if you’re unwilling to commit to learning the touch controls. I can’t take my PS4 onto this metaphorical bus, however. Playing Fortnite on the go really never gets old, and totally makes up for any frustration you may initially experience from the limitations of the hardware. Hopefully Epic open it to more people sooner rather than later, but until then, be sure to keep an eye on our Fortnite Discord server for free code giveaways and much, much more.